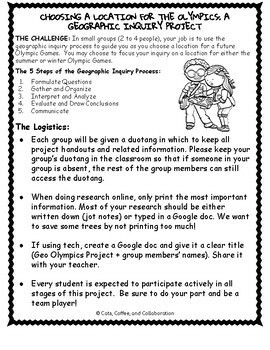 This is a great Geography research project that walks your students through the 5 steps of the geographic inquiry process while giving them lots of choice and independence to follow their learning where it takes them! 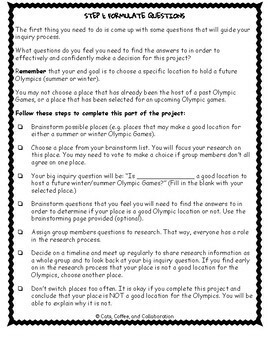 Students are asked to work in groups to choose a location that would be a good candidate to host a future Olympic Games. They will love this project! a mark rubric based on student/group completion of the 5-step inquiry process. 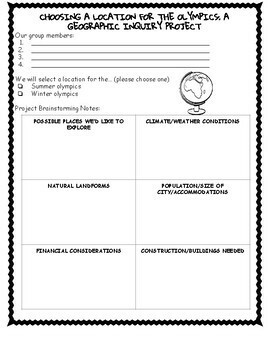 My students love the freedom this project allows them as they choose their topic, guiding questions, and the way in which they want to share their learning. I simply walk them through the inquiry process and give them lots of time to explore! I always stress to my students that there is no right or wrong answer when using this process. You simply go where your questions and take you! Thank you for purchasing this product. I hope your students love the inquiry process! All the best to you and happy teaching.